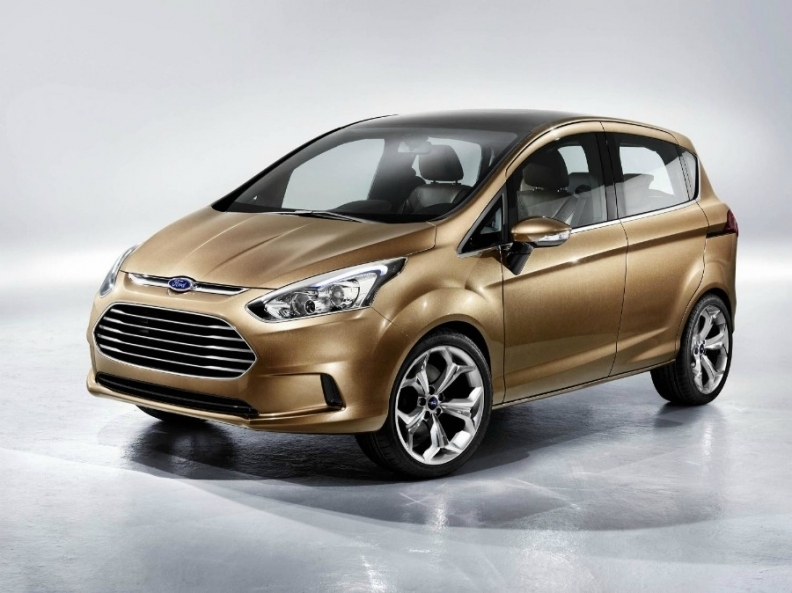 Ford demonstrated its new three-cylinder engine in the B-Max concept at the Geneva auto show in March. Ford Motor Co. will roll out globally its first 1.0-liter, three-cylinder engine. The unit was developed in England and shown in the B-Max concept at the Geneva auto show in March. The engine is part of a powertrain push by the automaker that also includes a new eight-speed transmission and an e-CVT, or electronic continuously variable transmission, for use in hybrid vehicles. The three-cylinder engine will be the automaker's smallest engine ever and will be used in global car lines such as Fiesta and Focus. It will have power output equal to or better than Ford's four-cylinder engines, Derrick Kuzak vice president of global product development, said last week at a briefing in Dearborn, Michigan, where Ford is based. "Our new 1.0-liter EcoBoost engine will give consumers looking for hybrid-like fuel economy a new, more affordable choice," he said. Ford has achieved fuel- economy improvement of as much as 20 percent by adding direct- injection technology that feeds precise amounts of gas to cylinders in smaller engines. Ford is targeting similar gains with the three-cylinder engine, Joe Bakaj, vice president of powertrain engineering, told reporters. The engine will be built at more than one plant, but Ford declined to say which of its plants worldwide could build it. The engine was developed at Ford's global center for small-capacity engines in Dunton, near London, England, where engineers focused on improving thermal efficiency and reducing friction of the engine's internal moving parts, especially during warm-up when an engine emits higher levels of CO2 and other pollutants. The engine was first seen in the Ford Start concept car that debuted at 2010 Beijing auto show and made its European debut in the B-Max minivan concept at the 2011 Geneva show. Ford said more technical and application details for the engine will be released in September at the IAA in Frankfurt. Ford is also developing an eight-speed automatic transmission, a move that allows it to keep pace with carmakers such as BMW, which offers it in the 5 series, and Chrysler, which will bring such a gearbox to its flagship 300 sedan. Ford did not say which vehicles will get the transmission. "The new gearbox will be the first with a number of advanced new technologies that will provide faster, smoother and more positive shifts," Bakaj said. The automaker also said it would develop its own hybrid transmission, replacing one currently made by Japanese supplier Aisin and used in Ford and Lincoln hybrids. Production will start late this year at Van Dyke Transmission Plant in suburban Detroit. Full volume production is slated for the first quarter of 2012. Ford said it is on track to launch five electrified vehicles in the U.S. by 2012 and in Europe by 2013. Electric and hybrid vehicles may account for as much as 25 percent of Ford sales by 2020, the company has said. AutoWeek, Reuters and Bloomberg contributed to this report.